An eye witness and several climbing experts familiar with the route and the techniques that are normally used on it have pieced together the most likely scenario — and it paints a grim portrait of possible overconfidence, complacency, miscommunication or all three. SAN FRANCISCO — Two climbers who plunged to their deaths from El Capitan were using a risky technique known as simul-climbing to increase their speed and may have neglected to attach their rope to an anchor or any safety device that could have prevented the first falling climber from pulling his partner off the cliff, said a witness and climbing experts. 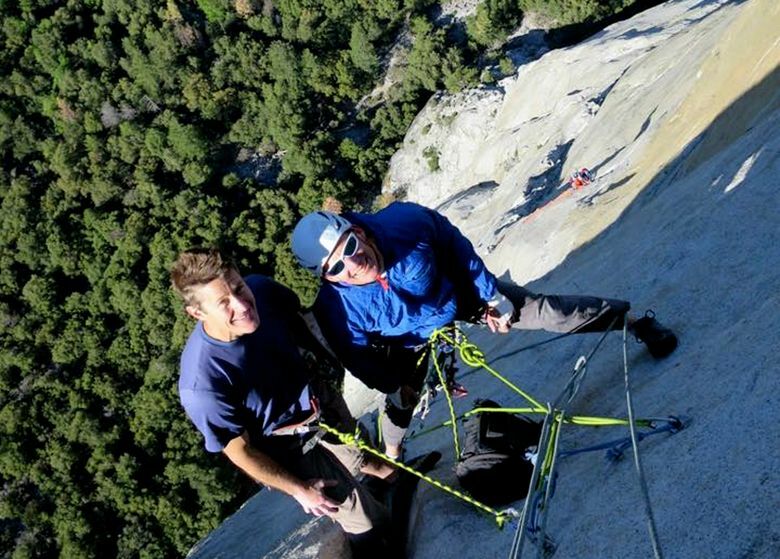 Best friends and longtime climbing partners Tim Klein, 42, of Palmdale, and Jason Wells, 46, of Boulder, Colorado, fell about 1,000 feet June 2 from what experts said was the easiest section of a route called Freeblast, which they had climbed many times before. It is impossible to know with any certainty exactly what happened, but one eye witness and several climbing experts familiar with the route and the techniques that are normally used on it have pieced together the most likely scenario — and it paints a grim portrait of possible overconfidence, complacency, miscommunication or all three. Cannon, 24, of Reno, Nevada, who was at the start of a five-day trek up a different route that begins on Freeblast, told The Chronicle he had climbed with the men for several pitches before letting them pass. He and his partner were about 200 feet below at the time of the accident. Instead he heard Klein yell “Oh f—,” as the rope pulled him off the wall. A split second later he too wooshed through the air, still attached to the rope. Their free fall was halted for a split second when the rope got snagged on a granite flake or block, but the force from two falling bodies was too much. Cannon later climbed up to the place where the accident occurred to help Prince, who, like himself, was traumatized, and saw rope abrasions on the rock, but could not find any remnant equipment that would indicate a safety-system failure. The lure of sponsorship money is pushing the masters of the sport to put themselves at greater peril, he said. A case in point is Honnold, who last June climbed a route known as Freerider, which includes the area where the recent accident occurred, without any ropes or protection. Honnold spent three hours and 59 minutes scaling the nearly vertical 3,000-foot granite face knowing that a single slip, missed handhold or unforeseen incident would result in certain, gruesome death. He is among a long line of Yosemite daredevils competing for deals with equipment manufacturers or advertisers who pay to market images of them scaling dangerous-looking rock faces.